Faith. Philosophy. The Public Square. 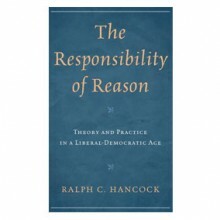 In The Responsibility of Reason, Ralph C. Hancock undertakes no less than to answer the Heideggerian challenge. Offering trenchant and original interpretations of Aristotle, Heidegger, Strauss, and Alexis de Tocqueville, he argues that Tocqueville saw the essential more clearly than apparently deeper philosophers. Hancock addresses political theorists on the question of the grounding of liberalism, and, at the same time, philosophers on the most basic questions of the meaning and limits of reason. Moreover, he shows how these questions are for us inseparable. The fundamental principles of American government, best outlined by Congress in 1776, are the keystone of American education. But without training in the moral and religious virtues, such education will fail. In our day, as in his own, John Adams challenges us to pay due attention to what is best in our republic and in ourselves.